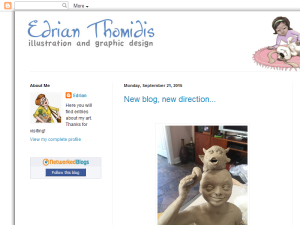 A blog full of art, design, crafts and other stuff from the life of Edrian Thomidis. This what your TENENGO : ART & GRAPHIC DESIGN BY EDRIAN THOMIDIS Blog Ad will look like to visitors! Of course you will want to use keywords and ad targeting to get the most out of your ad campaign! So purchase an ad space today before there all gone! I invite you to follow me over to my new Blog at ArtsySoul.com There you can stay in touch with me and see my new artwork. I have taken my work into a whole new direction... Come over and check it out! I had the urge to share another FREE coloring page. Click on image to enlarge and print. Enjoy! It has been a while since my last post, but I wanted to share a new coloring page. Just click on the image to enlarge and print. Enjoy and have a safe Halloween! If you are the owner of TENENGO : ART & GRAPHIC DESIGN BY EDRIAN THOMIDIS, or someone who enjoys this blog why not upgrade it to a Featured Listing or Permanent Listing?